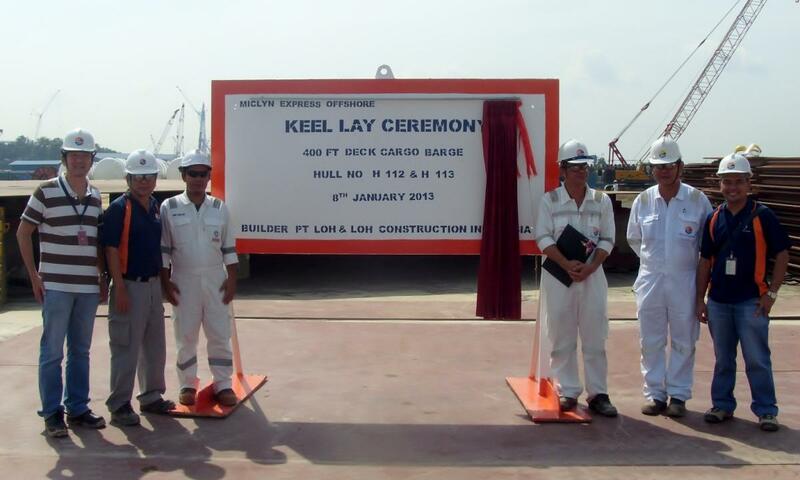 MEO recently held a keel laying ceremony at their Batam based shipyard, PT Loh & Loh. The barge will be the first of a new series of 400ft heavy deck cargo barges with ballast system. It was designed by 38 Marine & Offshore Pte Ltd, with input from the in-house MEO Engineering Team. Expected delivery is mid 2013. The 400ft barge is of steel all weld construction with a spoon head bow, flush deck and twin skegs. The main hull is divided by 7 transverse WT bulkheads and 3 longitudinal WT bulkheads into 31 compartments inclusive of a machinery/ballast control room. It has 2 x 280KW generators for electric power operation requirements and 2x 600M3/hr high capacity ballast pumps.